except for maybe Washington Nationals right fielder Jayson Werth. 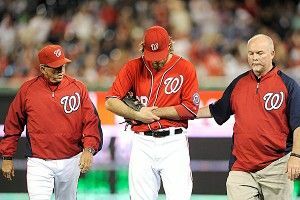 On Sunday, Werth broke his wrist during the finale of a three-game series between the Nationals and Phillies. It was a home game for the Nationals, but as with any game within reasonable driving distance of the Schuylkill River, there was an abundance of Phillies fans at the game. I am motivated to get back quickly and see to it personally those people never walk down Broad Street in celebration again,” he said. I’m not saying Werth can’t be mad, but the whole “I will have my revenge, in this life or the next” bit? C’mon. Jayson Werth played 543 regular-season games for Philadelphia. I guarantee you he has heard worse things than, “You deserve it,” from Phillies fans. Basketball Rules in Indiana. Why Don't the Pacers?